Spring has finally arrived! March happens to be National Nutrition Month®, and after a long winter, it’s always a good idea to “spring clean” your eating routine and focus on good nutrition. Speaking of nutrition, March 7 was National Cereal Day. To pay homage to cereal, this week, we’ll look at some facts (and foibles) about cereal, with tips on how to choose the healthiest cereal. • Sugary cereals top the list. According to data from IBISWorld and IRI, top-selling cereals include Honey Nut Cheerios, Frosted Flakes, and Honey Bunches of Oats. • Cereal still rules. Sales of cereal have dropped over recent years, as consumers look for healthier higher-protein, higher-fiber breakfasts. But Nielsen data shows that 90% of American households nonetheless contain cereal. Ninety-four percent of millennials have cereal in their homes — for them, cereal serves as a snack, as well as breakfast. Go to any supermarket and you’ll find shelves (and aisles) dedicated to cereal. How do you choose? It’s easy to spot the “kid-friendly” sugary cereals, but not so easy to find the cereals that provide decent nutrition without all the sugar and other undesirable ingredients, such as artificial colors. Scan the serving size. A new Nutrition Facts label is coming, which will (hopefully) make it easier for you to make sense of what you’re actually getting in your food. No matter what type of food you’re purchasing, go right to the Nutrition Facts panel on the package. Always look at the serving size. The serving size for cereals will vary — you might see 1 cup, 1/2 cup, or even 1/4 cup. If you eat more or less than the serving, your intake of calories, carbohydrate, fat, fiber, and other nutrients will vary, too. In general, cereals that are more energy dense, such as granola or muesli, will have smaller serving sizes because the equivalent amount has more calories than cereals like puffed grains or bran flakes. Find the fiber. Most of us only get about 15 grams of fiber each day, but we actually need between 25 (for women) and 38 (for men) grams of fiber. A great way to get a jump-start on fiber is to eat a fiber-rich cereal. How do you know which cereals are high in fiber? Again, check the label. Go for cereals with at least 3 grams of fiber per serving. Better yet, go for at least 5 grams of fiber per serving. Heavy-hitters include Kellogg’s All-Bran cereals, General Mills Fiber One, Kashi GoLean, and Uncle Sam Original Wheat Berry Flakes. Tip: Go easy with bran cereals if you don’t usually eat them. Too much fiber at once can cause stomach distress! Skimp on sugar. Keeping an eye on carbohydrate is important when you have diabetes. When it comes to cereals, for the most part, you’re going to get carbohydrate. The key is to eat cereals that get a good portion of their carbs from fiber and a minimal amount from sugar. You may not always be able to avoid sugar, but you can limit it. Select cereals that have no more than about 8 grams of sugar per serving (that’s about two teaspoons of sugar). Remember that if a cereal contains fruit, the sugar in that fruit will contribute to the cereal’s sugar content. Also, read the ingredient list. Sugar in any form (sucrose, honey, maple syrup, evaporated cane juice, and so on) should be further down the list. Since fruit in some cereals may be coated with sugar, it’s best to avoid these. Add your own fresh fruit, instead. Keep an eye on sodium. It’s hard to believe that cereal would even contain sodium, but most do. For example, a half-cup of Grape Nuts contains roughly 290 milligrams of sodium. On the other hand, one cup of Shredded Wheat has virtually no sodium, and neither does 1/2 cup of cooked Quaker Old-Fashioned Oats. A goal to aim for is a cereal with no more than 240 milligrams of sodium per serving. Kashi GoLean Original has 115 milligrams of sodium per each 1 1/4-cup serving; Uncle Sam Original Wheat Berry Flakes has 140 milligrams per 3/4-cup serving. Go for the grain. 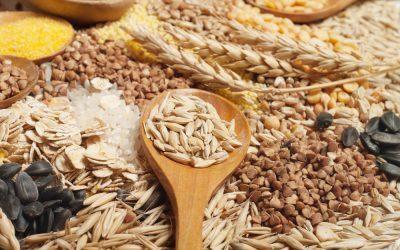 When choosing healthy carb foods, you’re best bet is to focus on whole-grain, unrefined carbs as often as possible. 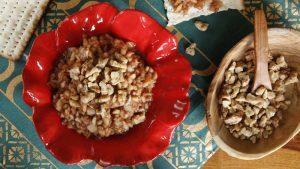 Whole-grain cereals (and breads, pasta, and crackers, too) have a lot going for them. They tend to have less of an impact on blood sugars; plus, they’ve been shown to help lower the risk of many types of diseases and conditions, including Type 2 diabetes, heart disease, diverticulosis (a condition in which pouches form in the large intestine), and some types of cancer. Look at the ingredient list of your cereal: The first ingredient should be some type of a whole grain, such as whole wheat, wheat berries, oats, or brown rice. Fit in some protein. In general, cereal isn’t known for being a high-protein food. But some brands do contain protein, especially whole-grain cereals. You’re off to a good start if you can find a cereal that contains at least 3 grams of protein per serving. Kashi GoLean Original contains 12 grams of protein per 1 1/4-cup serving. Kellogg’s Special K Protein has 10 grams of protein per 3/4-cup serving. Choose wisely when it comes to what you add to your cereal. By itself, cereal can make a pretty decent snack. If you’re adding milk, realize that it, too, contains calories, carbs, and sodium, as well as fat. Whole milk may not be as unhealthy as we once thought, but it contains more calories than low-fat or skim milk. Non-dairy milks, such as almond or rice milk, tend to have very little protein, and may be high in carbs thanks to added sugar. Go for unsweetened versions. To boost nutrition, consider adding some fresh fruit (berries are a great choice), a sprinkling of nuts or seeds (try chia seeds or ground flaxseed), or even a tablespoon of peanut or almond butter. Running allows Greg Weintraub to release that ongoing stress of thinking about Type 1 diabetes. Bookmark DiabetesSelfManagement.com and tune in tomorrow to read more about him.